Belgium and Holland maintain their neutrality in the power-politics of Europe. 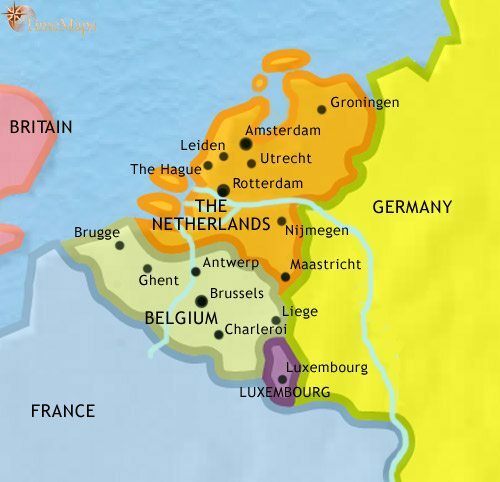 The Low Countries are divided amongst a number of semi-independent counties. The beginnings of a centuries-long land reclamation effort is going on in the Low Countries. 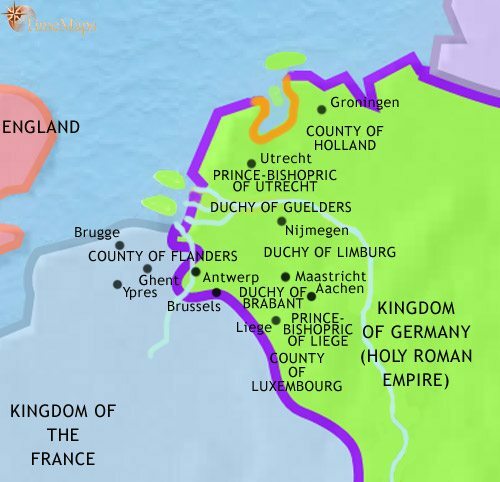 The dukes of Burgundy now rule the Low Countries. The prosperous new nation of the Netherlands has appeared on the map of Europe. The Netherlands have become a centre of world-wide commerce. The small country of Belgium has appeared on the map of Europe. Both Holland and Belgium are constitutional monarchies. Belgium, Holland and Luxembourg have all experienced invasion and occupation by Germany during World War 2. Belgium, Holland and Luxembourg are amongst the most prosperous countries in the world. Both Belgium and the Netherlands have adopted a neutral position in the diplomatic networks of Europe. Overseas, both small countries have acquired enormous empires. The Dutch East Indies empire has grown substantially in the past decades, expanding in Borneo and New Guinea. Belgium’s King Leopold II (reigned 1865-1909) acquired an enormous empire in the Congo (1898), virtually as a personal estate. The territory became a byword for large-scale abuse of human rights until the Belgian government took it over (1908), and tighter controls were introduced. Luxembourg gained its own sovereign in 1890 when the Dutch throne passed to a woman, Wilhelmena, and, according to the terms of the ancient Sallic Law, by which only a male could rule, the Grand Duchy passed to the nearest male relative, Adolf of Nassau. At the end of the 9th and throughout much of the 10th centuries, the Low Countries were badly affected by Viking attacks. In the absence of effective protection from the kings, local counts assumed wide powers, including building forts for local defence. The partitioning of the Frankish empire left the area divided between the West and East Frankish realms, and in the 10th century the East Frankish kings (the Holy Roman emperors) appointed dukes to uphold royal authority in the area (which at that time was called Lotharingia, or Lorraine). 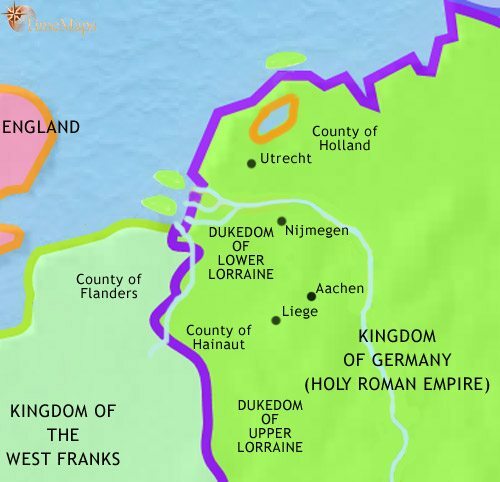 However, the duke’s power has remained weak, and has now been divided between Upper and Lower Lorraine – the dukes are evolving into local lords like the counts. These acknowledge the kings as their overlords, but in most matters go their own way. What royal authority there is in the area is upheld by the bishops. These are appointed by the kings, and try to look after his interests. The leading count in the area is count of Flanders, whose territory straddles the border between the West and East Frankish kingdoms. He is in vassal of both. Another leading local lord is the count of Holland, descended from Viking chiefs who settled in the region with their followers in the 10th century. In the 10th and 11th centuries, the Holy Roman emperors sought to impose their authority on the region through the bishops. This had the effect of creating a number of powerful prince-bishoprics, with Liege and Utrecht especially important. However, the Investiture Controversy of the 11th and 12th centuries undermined the emperors’ ability to appoint bishops, and these prince-bishoprics then became virtually independent states, alongside the principalities ruled by the local counts and dukes. These principalities, whether secular and ecclesiastical, continually struggled for more freedom from the emperor, and they struggled with one another for territory. Of them, Flanders was the most powerful. In northern Flanders, a process of reclaiming land from the sea had already begun, with the construction of dykes, canals and polders. Fields and villages are appearing where once was only sea. This is all part of a strong upswing in population, and with it an expansion of trade and the regional cloth industry. Cities such as Brugge, Ghent and Ypres are developing as major centres of commerce. 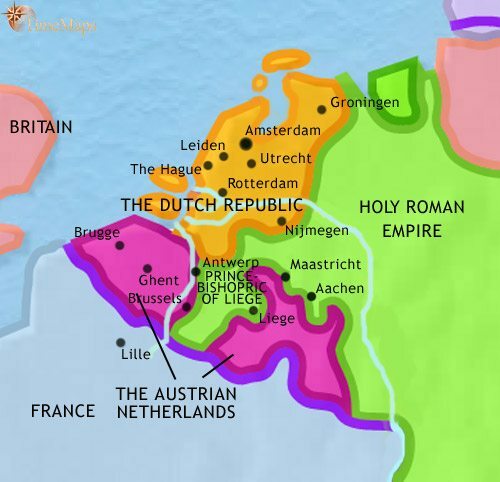 In the 13th and 14th centuries there was endemic conflict between the principalities of the Low Countries, which became part of a wider struggle for dominance between the kings of England and France. Finally, at the battle of the Golden Spurs in 1302, Flanders secured its independence, and confirmed its position of leadership within the Low Countries. In 1369, marriage brought the the county of Flanders under the duke of Burgundy, a scion of the French royal family. 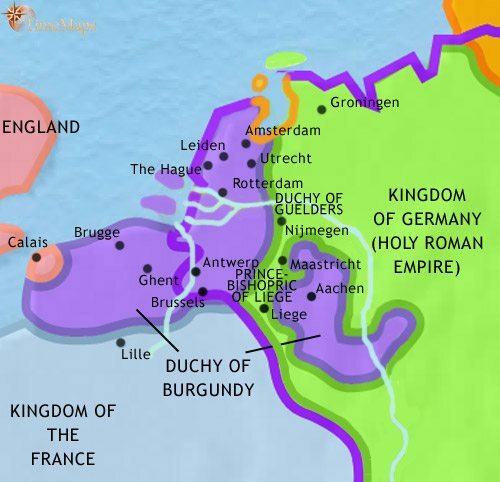 Further wars and marriage alliances brought the other principalities of the Low Countries under Burgundian control. By this time, Flanders was the centre of a large-scale cloth industry, and one of the wealthiest regions in Europe; this made it an ideal base upon which to build a new independent state, as the dukes of Burgundy were seeking to do. This wealth had caused towns to expand, and some, particularly Ghent, Brugge and Ypres, had become independent centres of political power under powerful urban aristocracies. The efforts of the dukes of Burgundy to turn their holdings into a new European power came to nothing when Charles the Bold was killed in battle (1477). His daughter Mary was married to Maximilian of Hapsburg, later Holy Roman emperor; and the bulk of Flanders passed under Hapsburg control. The south-western portion, however, is claimed by, and incorporated into, the kingdom of France. With the division of the Hapsburg lands between the Holy Roman emperor and the king of Spain in 1556, the Low Countries went to king Philip II of Spain. 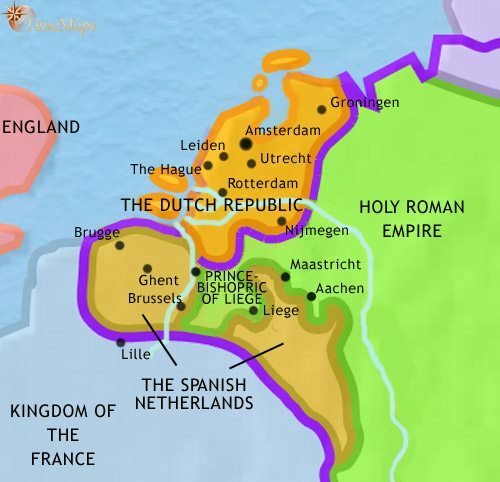 Philip’s attempts to impose a centralised form of government throughout his territories, coupled with his aggressive anti-Protestant religious policy, led to revolt in the Low Countries. The southern provinces were cowed into accepting Spanish rule, but the more Protestant northern provinces, united in the Union of Utrecht (1579), stood out in rebellion. By this period, the Dutch have the most dynamic economy in Europe, with Amsterdam the principle trading centre. This economic strength is decisive in helping the rebels to resist Spanish reconquest – as is the capable leadership of William of Orange, until his assassination in 1584. The war in the Netherlands splutters on until 1609, when the independence of the Dutch Republic is effectively secured, though not formally recognized by Spain until 1648. In the meantime, the Netherlands have become the leading commercial power in Europe, the centre of a global trading network and an expanding overseas empire. In the midst of the struggle for independence, a group of Amsterdam merchants found the Dutch East India Company (1602), which will go on to play a pivotal role in establishing Dutch trade, and later control, in the East Indies. The Dutch Republic embarked on a series of wars with England, fought mainly at sea. The fighting was fairly evenly matched, but the Dutch suffer proportionately more, as they were the smaller nation and, also, they were invaded by France in 1672. This invasion had the effect of drawing the Netherlands and England together and in 1688, William III of Orange, stadtholder of the Netherlands, becomes also king of England when his wife, Mary, inherits the throne. In the mid- to- late 17th century the Dutch continued to be the leading trading power in Europe. They expanded their overseas trade and empire, largely through the agency of the Dutch East India Company (VOC). They pioneered a number of important financial innovations, central to modern economic life: for example the development of joint-stock companies and the establishing of a central bank. In agriculture, too, they developed a market-orientated approach which led to major innovations, which, when spread to England, formed the basis of the Agricultural Revolution there. The rise of Britain as a maritime trading and naval power has eclipsed the Netherlands as the leading commercial nation in Europe, but the Dutch Republic has remained comparatively prosperous and politically stable during the 18th century. The Spanish Netherlands were transferred to the Austrian branch of the Hapsburg family in 1714. 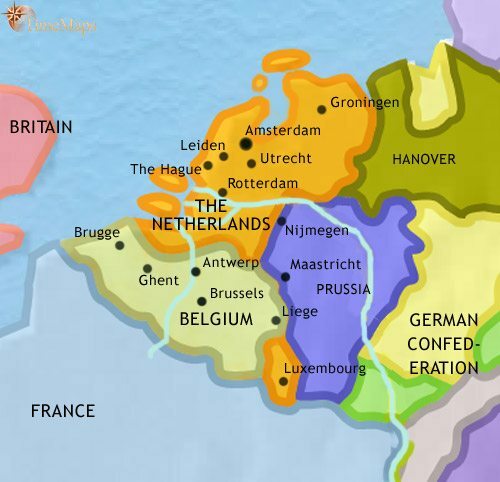 The Netherlands spent most of the Revolutionary and Napoleonic Wars (1793-1815) as a subject ally of France. At the peace settlement of 1815, the country was established as a kingdom, under the house of Orange, and the territory of the previous Austrian Netherlands was transferred to it, as a means of creating a strong state which might help check France’s ambitions in this part of Europe. The king of the Netherlands was given a wide degree of power. As well as being a convinced Protestent, he also pushed for equality of all citizens, including equality of religion. This involved the supression of the legal privileges of the Roman Catholic Church. This was deeply unpopular in the Catholic south, and led the inhabitants to rise against the Dutch (and Protestant)-dominated government 1830. They gained full statehood (in 1831) as a kingdom under their own constitutional monarch. The Grand Duchy of Luxembourg also becomes a separate state, but in personal union with the Dutch crown. The Netherlands have become a truly constitutional monarchy, with the powers of the monarch severely limited and power vested in an elected parliament. In terms of religion, the country is one of the most tolerant in Europe. Belgium is also a constitutional monarchy. Both Belgium and the Netherlands are amongst the most industrialized countries in Europe, and both have comprehensive railway networks. The Dutch have been building up their merchant shipping and overseas trade, particularly their commercial links with their East Indian possessions. The little country of Luxembourg was internationally recognized as an independent Grand Duchy in 1867, as a resolution to a diplomatic spat between Prussia, France and the Netherlands which nearly led to war. The office of Grand Duke is held by the King of the Netherlands, but Luxembourg is treated very much as its own state. 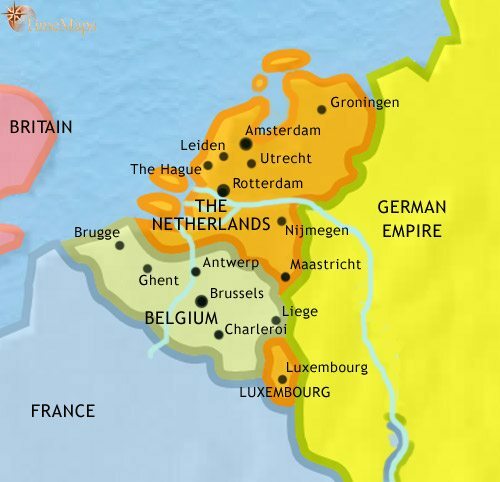 The Netherlands succeeded in remaining neutral throughout World War 1, but Belgium was occupied by Germany, and became the scene of some of the most ferocious trench warfare. Luxembourg was also occupied, but remained comparatively untouched by the fighting. After the war, the Belgians quickly rebuilt their prosperity, and built up a modern defence system. The Dutch embarked on their most ambitious land-reclamation project, the building of the Zuiderzee barrier. All three countries were occupied by the Germans in World War 2, the Netherlands after ferocious bombing. Since the war, the three countries have made rapid progress in rebuilding their economies. They formed a customs union, called Benelux, in 1948, and all are members of NATO and the European Common Market. The Dutch have lost the majority of their overseas empire, with the East Indies revolting against imperial rule and gaining independence as the country of Indonesia (1949). The Belgians have also withdrawn from the Congo (1960), leaving it in a state of chaos. All three Benelux countries, The Netherlands, Belgium and Luxembourg, have experienced prosperity in the past decades. Belgium’s capital, Brussels, is home to the headquarters of the European Union (EU). Internally, however, the country has experienced political instability, due to tensions between its different communities, particularly Walloons and Flemings. It has therefore adopted a federal constitution, giving a large measure of autonomy to the regions. This has only been a partial solution, and the tensions continue.